Demand for hot peppers is up, up, up, and supply is in hot pursuit, according to Fresh Plaza, a worldwide news aggregator for the fresh produce industry. While capsicum devotees seek out and get creative with the hots, market farmers and growers are sowing, growing, and marketing them with equal ardor and zeal. 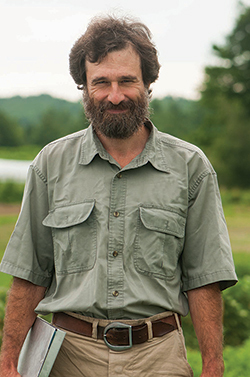 Meanwhile back at the research farm, Johnny's invests considerable time and energy toward sourcing, breeding, trialing, refining, and selecting the most promising pepper varieties from around the globe. From the hundreds we plant and scrutinize annually, only those that exhibit reliably superior performance and flavor make it into our line-up. This year we've expanded our line of peppers to offer even more options for a diversity of consumers — from specialty ethnic markets to foodies to high-end chefs with a nose for the novel. Looking to add new varieties to this year's grow list? To help you choose, we've drawn up this compendium of the 10 Types of Hot Peppers we offer: from Anaheim to Cayenne, Padrón to Santa Fe, we touch on origin, cultural, and culinary features. And for pepperheads of all magnitudes, we've included some tidbits about capsaicin and the Scoville Heat Scale, along with a recipe for 'Dragon's Toe' Jam to cool us down midstream! These peppers have a couple of alternate names: Anaheim is the California city where this type of chili is said to have been brought in the late 1800's from New Mexico. 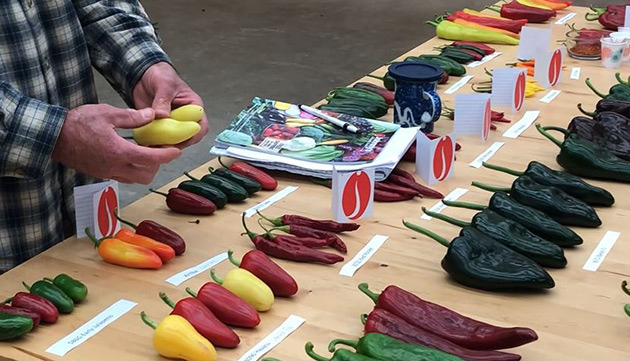 Numex signifies the likelihood that a pepper's forebears were bred at New Mexico State University. Dating back to 1888, NMSU is home of the longest known continuous program of chili pepper improvement. This type is widely available, and one of the most common chili types in the US. Though relatively mild in heat, the flavor is sharp and somewhat acidic. Usually used when green; can also be used when red. 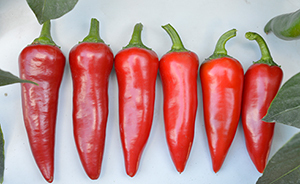 In New Mexico, Anaheim/Numex peppers are commonly sliced and fried and served as a side dish. Nice roasted and eaten as a snack or appetizer. Sometimes used to make chilli rellanos for those who find Poblanos too spicy. Red varieties are often strung together to form ristras. An organic variety bred by Johnny's, 'Highlander' is easy to grow, with good adaptability and excellent flavor. It is early and productive, even in cooler areas. Moderately thick walls allow them to hold up when stuffed. 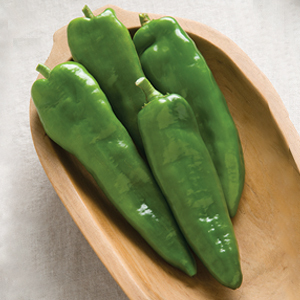 When fresh they are called poblanos; when dried, they are called ancho, Spanish for "wide chili." Baron: This is a classic flat, semi-heart-shaped poblano that is well-suited for grilling and stuffing for chiles rellenos. Whet your appetite with our video! Said to have originated in Cayenne, the capital city of French Guiana, which derives in turn from the Tupi Indian word, kyinha. Piquant, orange to deep-red fruits are typically ground into powder for use as seasoning. They are excellent for providing both heat and flavor to many different cuisines. 'Amazing 2' is a traditional Korean drying pepper for use in kim chi and other dishes. During my last visit to Korea, I learned they grow more acreage of hot peppers than any other crop. 'Amazing 2' was bred to provide mild heat with deep pepper flavor; in Korea, kim chi is often not the hottest dish on the menu but serves more as an (approximately!) mouth-cooling interlude between other, hotter dishes. The fruits have a thick cuticle, which may help them not to rot, as the climate can be very hot and humid there. It is dehydrated, rather than used fresh, and makes very nice flakes when ground. 'Red Ember' is an AAS Award-winning, Johnny's-Bred cayenne prized for its versatility and a smoky-sweet/moderate-heat flavor. Great for using in recipes as well as sprinkling on cooked foods. Read more about Red Ember's culinary properties in our Recipe Preview for Sambal Matah, a Balinese relish, with New York Times Bestselling chef Frank Giglio, of Three Lily Farms. Bred by Clarence Brown Hamlin and released in 1952, this type is named for Fresno, California. Fresno peppers are widely grown throughout California, where they are available nearly year-round. Highly versatile, whether green/immature or red/ripe. Typically used fresh for garnishes, in relishes, salsa, or ceviche; added to stir-fries and hot sauce; or sautéed. Thick walls make them suitable for stuffing, but they are not recommended for drying. 'Flaming Flare' is a widely adapted, AAS award-winning variety with a flavor that nicely combines sweetness with heat. 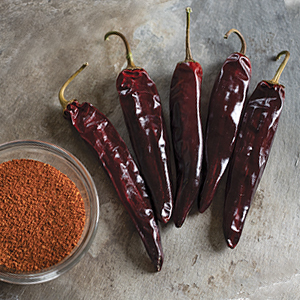 Translated from the Spanish, guajillo means "big pod." Primarily for making powder, as the skin is tough when used fresh. Flavor is prized for fruit undertones. Since the heat level is low, guajillos can be used quite liberally in cooking, achieving an excellent pepper flavor without excess heat. Excellent for moles, adobo sauces, chili Colorado. 'El Eden' is a flavorful variety very popular in Mexico for drying and grinding into powder. Hybrid habanero that's early and hot — we give it a 5! Far and wide — this is our catch-all category. The habanero types in this group, including 'Helios,' can be slower than other types, so could be sown a week or two earlier than all of the other sweet and hot peppers. So many possibilities… Try the recipe for Dragon's Toe Jam. 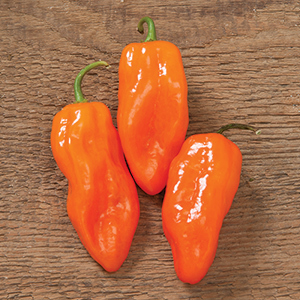 'Helios': Early, extremely hot habanero with shiny, vibrant orange coloration when ripe. Adaptable to long- or short-season production. Use sparingly in salsas, bean stews, or Indian curries for its heat and floral notes. Can also be chopped and added fresh to chutneys, salsas, and sauces; pickled; dried; or made into jelly. Habanero means "from Havana," and this group, which is thought to have originated in Cuba, is characteristically associated with Caribbean foods such as jerk sauce. 'Dragon's Toe': Excellent for stir-fries as their thin-walled fruits cook quickly. As with all hot peppers, this variety works well as an ingredient in Hot Pepper Jam or Jelly recipes like the one below. Active Time: 20–30 min. Total Time: 24 hr. Note: Ratio of hot to sweet pepper in this recipe is 3:5. Modify the ratio to suit your palate. Excellent for stir-fries as their thin-walled fruits cook quickly. Place 'Dragon's Toe' and green bell peppers in food processor fitted with steel blade. Gently pulse until peppers are minced, scraping sides of bowl as needed. Transfer peppers to a large, nonreactive saucepan or enamel Dutch oven. Stir in sugar, vinegar, lemon juice, and salt; bring to a boil over medium-high heat. Reduce heat to medium-low and simmer for 10 minutes. Return heat to high and bring mixture to a rolling boil. Stir in pectin and boil for 1 minute, stirring constantly. Remove from heat. Ladle jam into 7 sterilized, 8-oz. jars, leaving ¼" headspace. Cover and process jars in boiling hot water bath for 10 minutes. Remove from water and let cool for 24 hours. As with so many other types of peppers, jalapeños are named for the region where they were traditionally cultivated: Jalapa, the capital city of Veracruz, Mexico. Spanish for "from Xalapa," jalapa is a word of Nahuatl (an Aztec language) origin, formed from the roots xālli "sand" + āpan "water place." Jalapeños remain the most widely used hot pepper in Mexico as well as the United states. The thin, slight cracking on the skin of the fruits is called checking, a trait positively correlated with heat level. 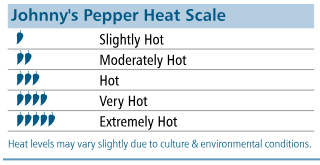 Growing conditions that favor increased heat level also cause the pepper to form scars, but here in the US the checking is considered cosmetically undesirable, whereas in other markets it is sometimes preferred. This most common of pepper types is prepared in a variety of ways and featured as an ingredient in many types of recipes; they can be stuffed and served cooked or raw, pickled and served atop nachos, smoked (chipotles), jellied, sautéed in oil (chile toreados), chopped into salsas and chilis, and served alongside phở and bánh mì in place of the less widely available, fresh Thai chilis. 'El Jefe': Best combination of earliness, disease resistance, and yield in a jalapeño. If you want a whole lot of hot peppers at once, this is a really good choice. 'Jalafuego': Large and strong, disease-resistant plants produce abundant yields of smooth, spicy fruits that are perfect for poppers, salsa, canning, freezing, or drying. Can be harvested when green or red. Also known as pementos de Padrón, from the Padrón municipality within the autonomous community of Galicia in Northwestern Spain. Os pementos de Padrón, uns pican e outros non ("Padrón peppers, some are hot, some are not"). Harvested before reaching 2–3" in length, fruits will be mild except for a small proportion that may be hot. Fruits all become hot if allowed to grow to 2" or longer. To some extent, level of heat is also governed by water, sunlight, and temperature. Typically roasted and served with olive oil and salt. 'Padrón': This eponymous, open-pollinated heirloom is widely enjoyed for tapas. 'Havasu': Often harvested for pickling when yellow, they can also be used in their riper red stage. This is a blistering-hot pepper that can be used to lend sizzle to variety of dishes. Easy to grow, great for containers, and wicked hot! Originated in the mountainous regions of the Mexican states of Puebla and Hidalgo. 'Hot Rod': This variety is easy to grow, great for containers, and reliably hot. Ever wonder what causes the buzzing sensation on your lips and tongue when you eat a hot pepper? Credit goes to a whole group of phytochemicals called capsaicinoids, the concentrations of which contribute to their pungency. The subcomponent of capcsaicinoids that is responsible for their pungency is capsaicin, or CPS to molecular biologists. Capsaicin stimulates our nerve cells to create the tingling, redness, and sweating associated with pepper consumption. At the cellular level, CPS has been studied for its ability to induce a process called nonshivering thermogenesis, in which cells burn energy to release heat, increasing our metabolism and body temperature. The author of one study notes that capsaicin is "first natural drug" known to augment the thermogenesis process, helping to explain some of its effects on the health of the body. Hot chili peppers, are customarily categorized by their capsaicin content — their heat. They are commonly ranked on the Scoville Heat Unit (SHU) scale, on which a bell pepper contains 0 SHU, a Biquinho approximately 1000, a Guajillo approximately 3000, a Serrano 10,000–23,000, and a Habanero 350,000–570,000. The score on the scale represents the level of dilution required for the sensation of heat to disappear completely. The prize for hottest pepper known changes hands over the years. Currently it's claimed by 'Pepper X,' at over 3 million Scoville Heat Units, bred by the same individual who created the 'Carolina Reaper,' a C. chinense cultivar bred in South Carolina. Some of us wax nostalgic for the days before 'Bhut Jolokia,' a C. chinense pepper from India, was toppled from it pedestal as the hottest, at a mere 1 million Scoville Heat Units. At Johnny's, we rank our peppers on a relative scale of heat, from slightly hot to extremely hot, designated with 1 to 5 pepper icons. We prefer this shorthand version because of the wide variation in SHUs, both between crops of the same variety when grown under different conditions, individual plants within a single crop, and even peppers from the same plant. Look for the pepper icons in the Quick Facts boxes of our product webpages and alongside each variety in the Hot Pepper section of our catalog. Watch a tutorial on a technique we use each year to cross parent plants in our classical pepper breeding program. We hope this overview helps pique your desire to grow and taste-test the latest additions of hots and exotics to our line of peppers. Along with being great for revving up the metabolism, we think they complement our more traditional, tried-and-true hotties. Add one or more to your grow list this year, and let us know how they grow for you! 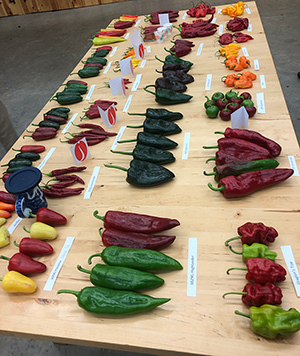 About heat and heat testing, from the experts at the Chile Pepper Institute at NMSU.